Depending your club size you could have everyone create circles of 8-10 people and pass a spoon around as music plays. When the music stops, whoever is left holding the spoon must eat a spoonful of baby food. If you eat a bite, you're still in, if you refuse to eat, you're out of the game. It’s like hot potato but only tastes worse. Whoever lasts the longest wins! Baby Food. Get the grossest flavors you can find. My favorites are Vegetables & Beef, Prunes, and Turkey Dinner. Spoon(s). Depending on your club size, you could get enough for everyone that plays to have one. You don’t want to use the same spoon every round, that would be grosser than eating the baby food. You could play this game with everyone participating which means you'll have multiple circles all over the room playing at the same time. But if you just wanted to find 6-8 kids, and play as an upfront game, you could also do it that way. Once the circles are formed, start the music. 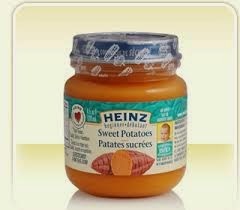 You can either pass a spoon or pass different jars of baby food. To make folks get out faster, you could pass multiple jars of food. When the music stops, the person holding the spoon (or jar) must eat a spoonful of baby food or they are out of the game. Every round starts with music and spoon passing, and ends with the music stopping and baby food consumption. Whoever is the last person left wins! *You could also pass a bag of doughnut holes with the jars of nasty baby food to give them a positive option. **You could also make the game go faster by someone getting out after they've eaten the baby food.